As I write this column, my thoughts are still about Fr. Thomas Hopko’s recent death. Deacons Alex and Mark, Thomas Kuang, Megan Leathers, the Rush family, and I paid our respects to the Hopko family by attending either Fr. Thomas’s Panikhida the evening before his burial or at the funeral itself, which was held on March 23 near Ellwood City at Holy Transfiguration Monastery. It was a time of joyful sorrow, as we like to say: a foretaste of Pascha, an anticipation of the Kingdom of Heaven, with eight bishops and more than 60 priests and deacons joining a total of 350 mourners in prayer. We had each come to know Fr. Tom in various ways: as a seminary student or a friend of his family, as a retreatant or podcast listener, as a reader of his many works, or as a collaborator in various Church projects and objectives. Each of us had benefited from knowing him, listening to him, and being absolutely captivated by his delivery, as he expounded on one topic of Church life or another. 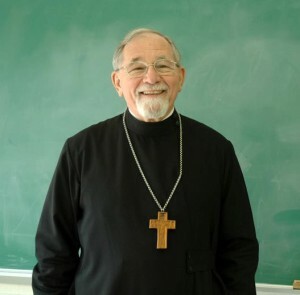 I always cherished the respect that he gave me in the field of church growth and development, inviting me to lecture to seniors at St. Vladimir’s Seminary each year, from the time I moved here in 1996 until his retirement in 2002. More recently, during the OCA’s “time of troubles,” Fr. Tom provided me pastoral guidance, reassurance, and perspective when I deeply needed it. Fr. Hopko’s passing signals the end of an era for American Orthodoxy, ushered in by such luminaries as Frs. Georges Florovsky, Alexander Schmemann, and John Meyendorff. American-born, he truly embraced the hope for Orthodoxy in America as those preceding him had championed in their own ways. He carried that torch until his death. His contribution to world Orthodoxy in our time cannot be overstated. It is the end of an era but not the end of a vision. Our sincerest condolences go to all the Hopko family, especially Matushka Anne, as well as grandsons Dan Thetford and Zach Mandell, both of whom led our OCF campus ministry during their respective years at Penn State. Memory Eternal, Fr. Tom! Memory Eternal.